Christchurch residents will soon be zooming around the city in shareable electric cars – one of the only fully electric car-share schemes in the world. In November a pool of 70 electric vehicles will launch at three hubs across the city, with a further 30 cars in 10 locations to follow in February. A vehicle-sharing scheme allows customers to pick up and drop off communal cars at different locations, in a similar fashion to bicycle-sharing schemes popular in cities around the world, including Christchurch. The service will be available to the public and to 11 initial businesses, including the Christchurch City Council, Environment Canterbury, Ara Institute, Canterbury District Health Board, Beca and Tonkin and Taylor. Initial vehicle hubs were planned for Christchurch International Airport, the West End and the Christchurch Art Gallery. 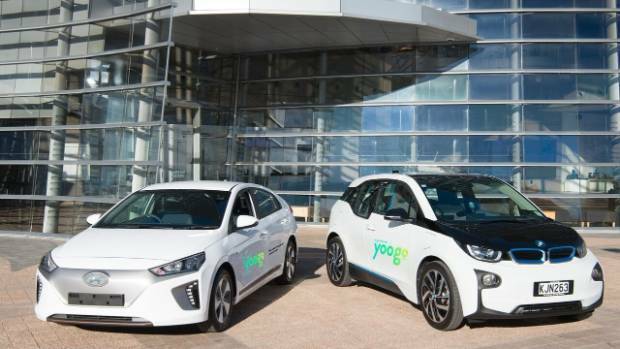 Run by Kiwi fleet management company Yoogo, the troupe of cars are expected to be a "smart and sustainable way to get around town". Further vehicle hubs were planned for Lichfield Street, The Crossing car park, Ara Institute, University of Canterbury, Papanui and Fendalton Libraries and Lyttelton Community Centre. Vehicles will include Hyundai Ioniq and BMWi3. Having to share assets is a sign of poor nation or a society in decline. In a wealthy society, everyone can afford to own their own things. The only enemy of the electric bicycle community is the government. Think about it. Who bans or restricts your use of electric bikes, other than the government? Smaller Government = More Freedom. Owning an asset that you only use 5% of the time is wasteful, inefficient, financially illogical, and socially irresponsible. if there is a practical alternative that fills the same roll for more people, using less resources, and lower financial investment ,..then that is a smart solution. ...and it may just get a few more cars off the overcrowded roads. According to that logic Hillhater, we should also share bicycles, washers, blenders and most everything else that we only use 5% of the time. All in the name of saving resources, right? If we can each afford the asset, we don't share it just to avoid building more of them; we just build more of them. Why should cars be any different? Your second point, that sharing things is a smart solution only seems valid if all us surfs are going to be managed by some elites who run our lives for us for our own good. We don't want to be forced into someone's idea of a smart solution, we want to freely choose the options that bring each of us the most personal enjoyment. Shouldn't that be the true "smart solution"? Last edited by Izits on Sep 06 2017 3:02am, edited 9 times in total. There's no need to make a big argument on this, if Hilhater goes to a laundermat then he DOES share a washer/dryer, right? There HAVE been experiments with bike sharing and some might still be going on. All this is an offering of rental cars, not particularly unusual, etc. Sometimes it's the growing accessibility that makes the sharing possible for people who'd have never had the chance to own their own. I really don't see the socialism/society in decline of it. Although sometimes I DO see the entire North American continent as being in decline, so maybe they are down under, too. My point is that sharing assets is not a sign of anything good, it's not a goal for society to aspire to. It's a sign of poverty and a way to get by on less money. Most of the people who use a laundromat do so because they can't afford a new washer and a big enough house to put it in. Izits wrote: My point is that sharing assets is not a sign of anything good, it's not a goal for society to aspire to. It's a sign of poverty and a way to get by on less money. Woah there! Calm down, comrade! Most people who use laundromats do so because they live in an apartment which is what is most readily available in a crowded city. Sharing things like cars is only a sign of poverty if you choose to view it that way. I live in a very affluent city which has bike shares and car shares that are extremely popular. The people using them are young and have a new way of thinking. They don't want to own these tings, they just want to use them sometimes. They don't want to have a garage on their house, they don't want to find parking everyday, they don't want to lug a bike up five flights of stairs. We have busy libraries close to large used book stores. We have tool borrowing services. We have active Facebook groups where people trade services and items. Not everybody wants to spend their money on items they barely use to show off to their neighbours. Extravagence is not the only sign of wealth. Yoogo/Yugo. You go find parts. The name alone is kind of a downer. Car share (ICEs) is common in most big cities of the world. Its just short term/distance car rental,..another form of public transport,..kind of like a drive yourself Taxi. Using an EV is a natural progress for that business model. Its probably not necessary or practical in country areas, but in cities with limited and expensive parking, it makes a lot of sense.